Thanks for that, but that seems to only have vets that specialise in reptiles their are alot of vets in the uk that don't have a qualification that says they are specialised but they are good. 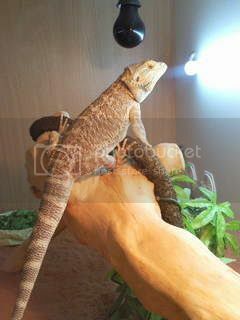 My vet isn't Qualified as a specialist but i trust him and hes operated on both my bearded both have survived one was an impaction so possible sand or build up of calcium in the gut and he removed it successfully and the other was a problem with my female as she was pregnant but hadn't released her eggs from the ovaries. There's non listed for Leicestershire either but I asked our excellent local reptile shop and he recommended 2 reptile vets within about 20 miles from us. I just checked the link (better to be safe than sorry) however it appears that the link no longer works. I think it's because that forum has recently been changed - just had a little search on there and can't find it. Rick (our resident expert) is a Moderator on that forum so maybe he can tell us where is has been moved to? Thanks for the info re Ashleigh Vets, as we are newbies to being beardy owners, I was wondering about taking our new beardy to a suitable vet in the area. I am off work for a few days next week and wanted to get a general check up and advice, would it be a good idea to to book in with Ashleigh or is there anywhere a bit closer that members would reccomend in the south Lancs/ north Cheshire area?